what are the cabinets made of and what stain? The countertops are thicker than normal. Were the cabinets lowered because of this? What is the total height of the cabinet and countertops combined? The normal height is 36" , were you able to obtain that height? 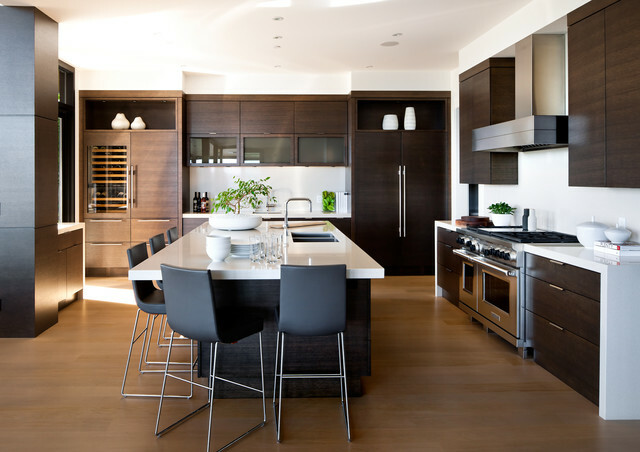 I am installing rift sawn white oak cabinets identical to this in my new kitchen. The cabinet builder used veneer on the cabinet doors, but solid wood trim around the doors. The wood grain is beautiful unstained, but so far all of the stains we've tried look awful on the veneer. I'm shooting for a dark look with minimal red (just like your cabinets). What stain brand/color/mix was used to achieve this look? Any help you can give me would be appreciated!! I'm trying not to freak out over my veneer issue. Range Hood - Details of the range hood? Can you please tell me what make the hood vent is? Can you please tell us who did the cabinets? What is the material on the island countertop please? The material is an engineered stone from Diresco. Countertops and Upper Cabinetry - Hello. I just love this kitchen! Could you please inform me of the distance between the countertops and upper cabinetry on each side of the island. Also what brand, colour, finish and thickness of countertops did you use? Thank you very much. Flooring Details Please! - Hello. I really love these floors and am looking for a quality engineered white oak. Could you please inform me of the brand, style, size, finish, etc., in addition to letting me know whether they were finished prior to installation or whether they were site finished. I look forward to your response. Thank you. The stools are by Montis from Holland. They are called the JIM stool. They are available from Inform Interiors here in Vancouver. Great kitchen, what type of flooring have you used ? Many thanks. This was an engineered white oak hardwood floor. Stools - Hi, could you please provide us with the maker of the stools and/or possibly where to find them. Thanks in advance for all your help! ceiling - how tall are the ceilings and how much of a furrdown is there? HOOD - is the beautiful hood custom? if not, who makes it! ? Its beautiful! ceiling heights - Do you know the ceiling height in this kitchen and how much of a furr-down there is? I love the 'modern' crown at the top of the cabinets! What are the dimensions for this kitchen?